There was wind. Some snow. 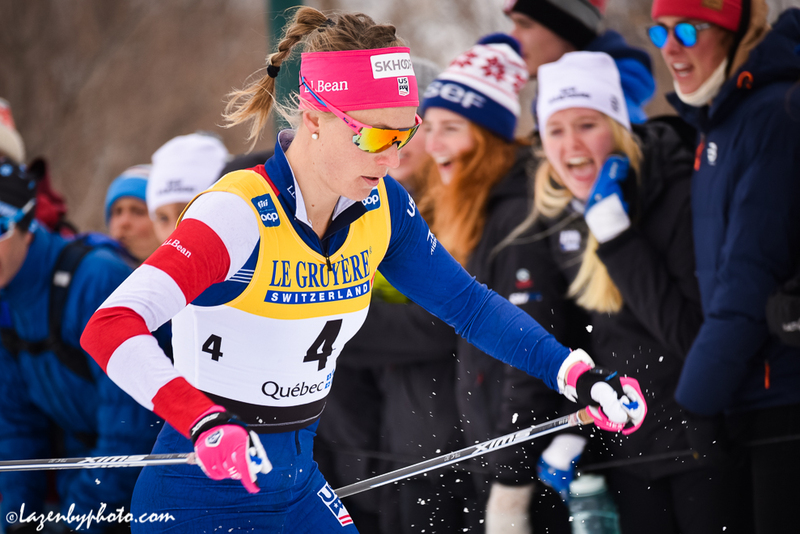 And certainly 1.6-kilometers of soft leg-sapping snow during Friday’s freestyle sprint in Québec. This was no 2.5 minute in duration hard-pack speed fest. It was a grind. Take off too early and plenty of real estate remained for a decaying fade. Sit back, control the effort, ride the draft a bit on the skier train and the slow snow could, in fact, keep those more tempered athletes in the game. This much was clear: it was a near four-minute sprint effort that blurred the lines of the sprint-endurance divide. Sweden’s Stina Nilsson proved her endurance sprint cred with the win. 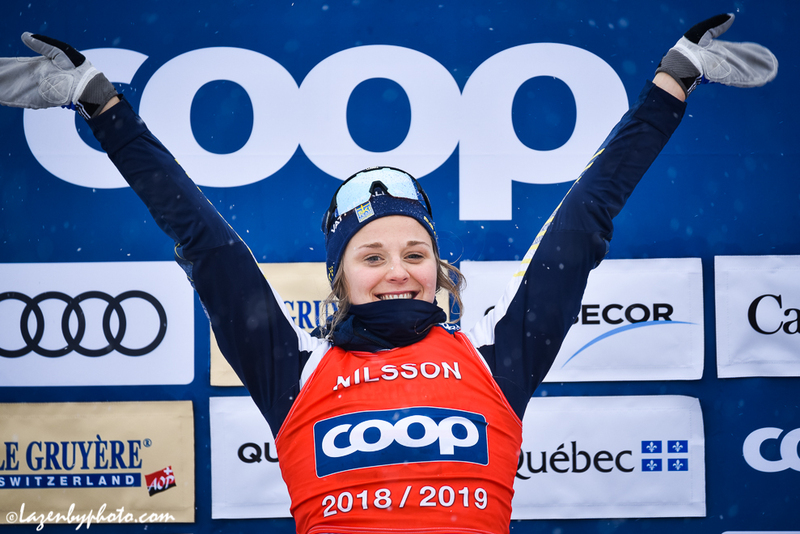 After qualifying in second behind her teammate Jonna Sundling, Nilsson won her quarterfinal, her semi, and the final for her 18th career World Cup sprint victory. 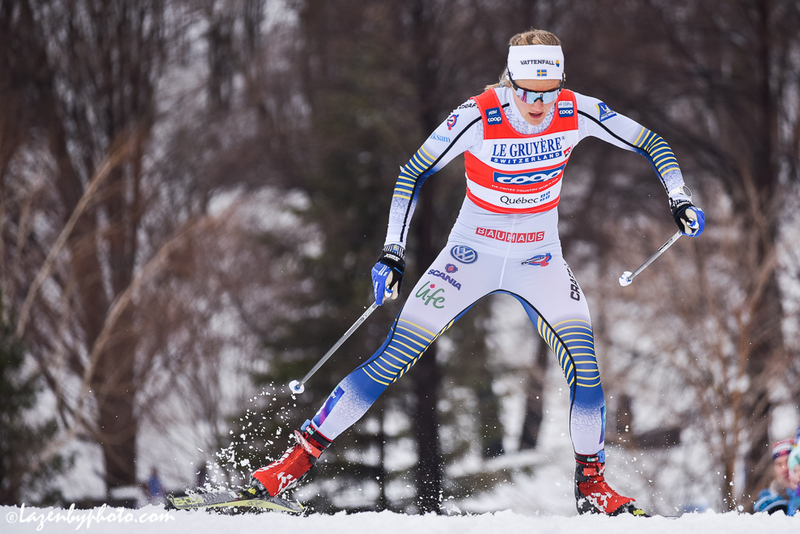 With the win, Nilsson could prep to fly the sprint crystal globe back to Sweden. 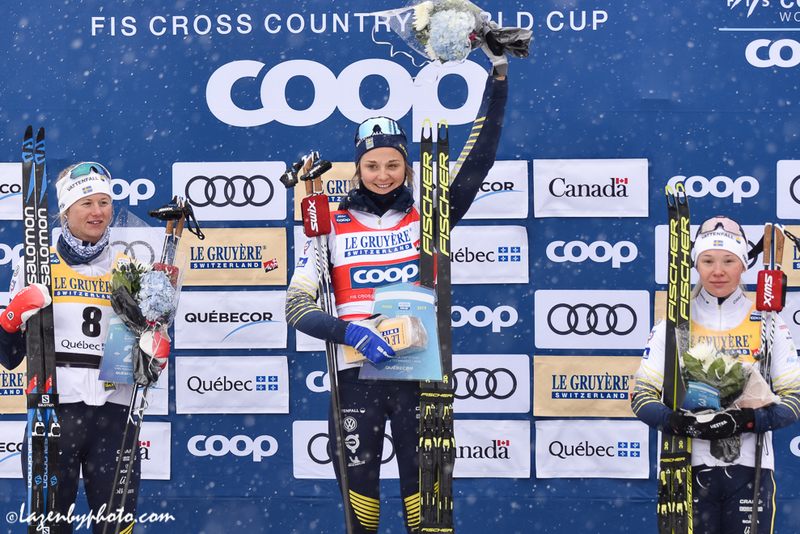 Nilsson came to Québec with a 33 point lead on Norway’s Maiken Caspersen Falla for the sprint cup. The math does not lie. Nilsson earned 50 points for the win, whereas Falla earned 40 points after placing fourth overall. As a result, Falla placed second in the sprint cup standings with a deficit of 43 points. 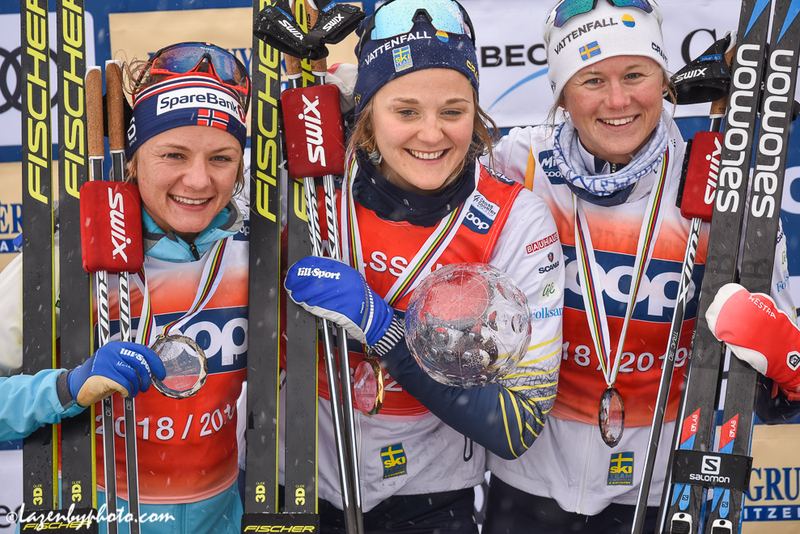 During Friday’s final that featured four Swedes including Nilsson, Sundling, Maja Dahlqvist, and Frida Karlsson, as well as Falla and American Sadie Bjornsen, the power in numbers proved true. 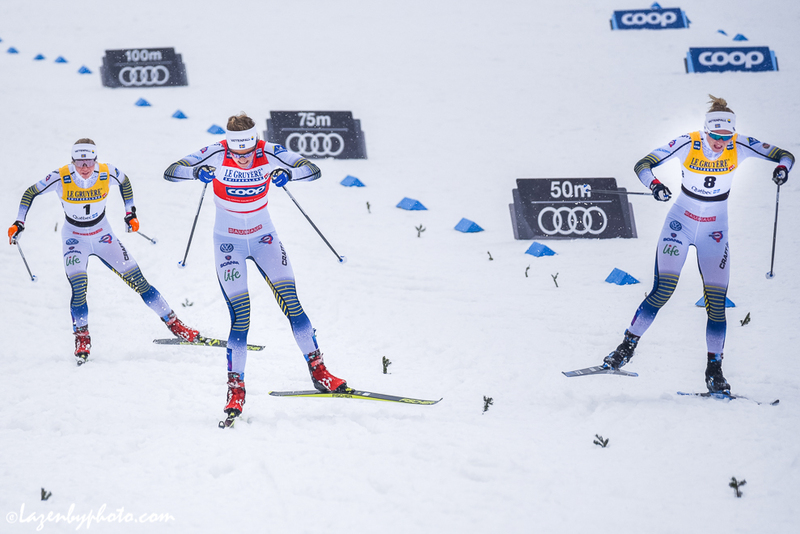 With Nilsson in first, Dahlqvist placed second, and Sundling third. 1-2-3 the Swedes came into the finish straight. 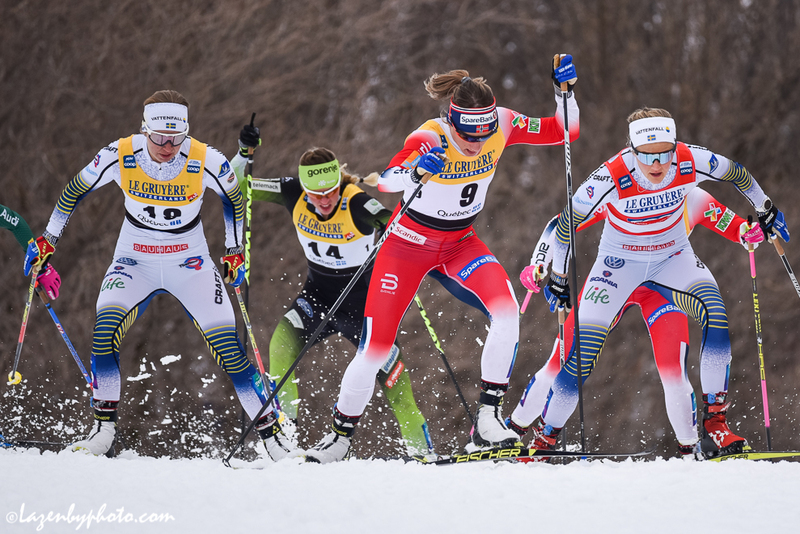 Nilsson and Dahlqvist separated themselves as they sped down the last one hundred meters. The toes did the work across the line as Nilsson and Dahlquist crossed for a photo finish. Nilsson won in 3:44.80 with Dahlqvist 0.01 seconds back. The U.S. women were positioned well on the day. 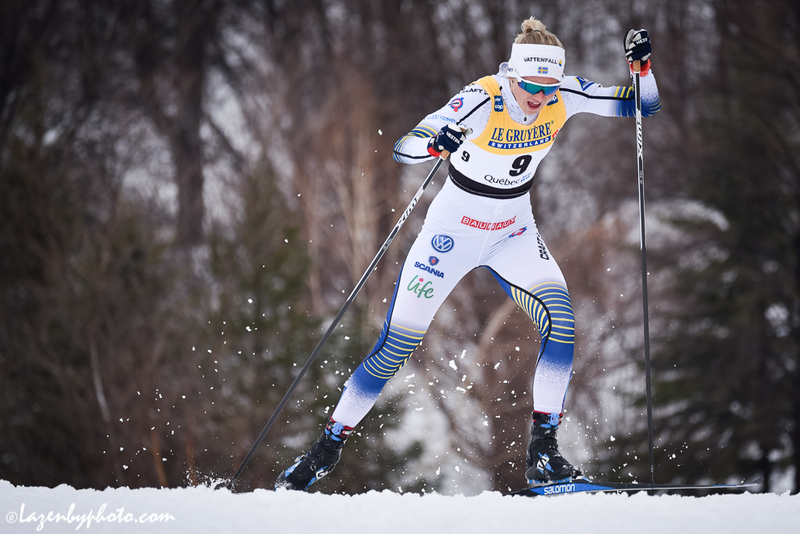 Bjornsen qualified in fourth, Sophie Caldwell in seventh, and Jessie Diggins 15th. Caldwell moved to the semis after placing second in her heat. In the first semi, Caldwell placed third and did not advance. Yet, is was her twenty-ninth birthday and the cheers were loud for the native Vermonter. “My parents, my sister, my brother, my cousins, my grandpa, friends, it’s awesome,” Caldwell rattled off when asked who was in Québec to support her. She placed seventh overall and ranked fourth in the final standings for the sprint cup. Paired up in the Bjornsen-Diggins semi was Sweden’s Charlotte Kalla — a formidable distance skier who last made a World Cup sprint final in 2014. Rounding a tight left-handed corner, Diggins was positioned on the inside when Kalla moved towards the apex and collided with Diggins. Then Bjornsen, only feet behind, became tangled too. 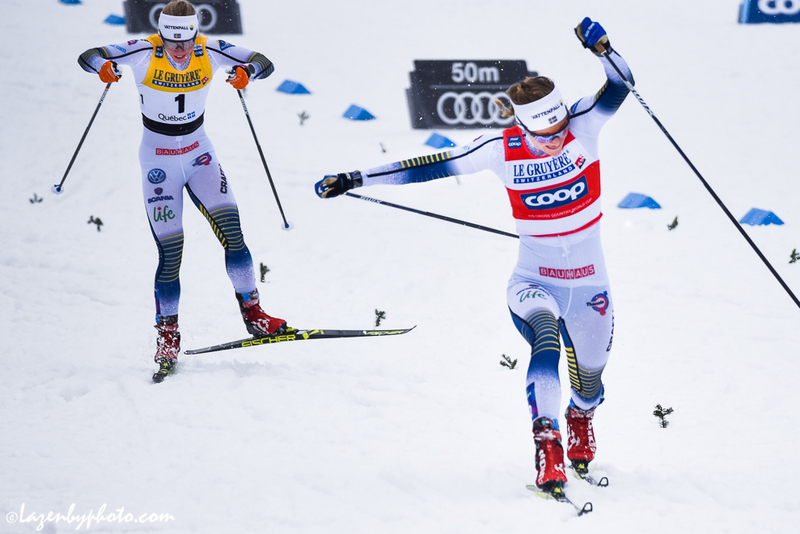 On a course with slower snow and times that looked epic compared to some shorter and faster sprint courses in Europe, Bjornsen and Diggins pulled off a miraculous chase. After the tangle with Kalla, the two looked way, way … way back. 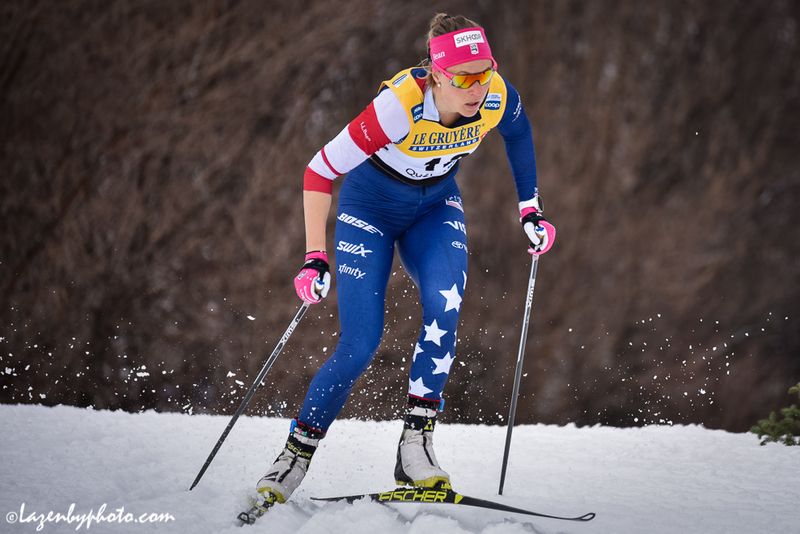 Diggins and Bjornsen charged. Meter by meter they made the catch to the leading trio of Dahlqvist, Falla, and Karlsson. But they were never comfortably locked on. 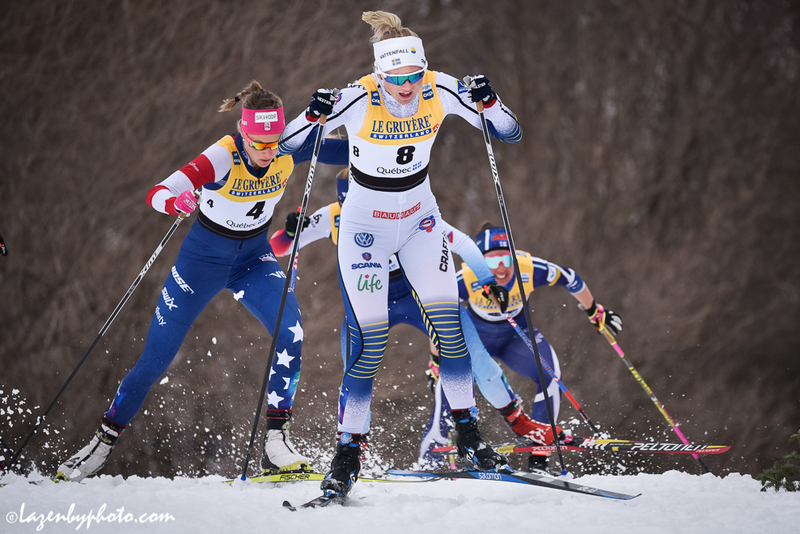 Into the finish, Bjornsen and Diggins went head to head with Bjornsen ending up fourth and Diggins fifth. And with that semi’s speed, Bjornsen became a lucky loser. In the final, Bjornsen placed sixth to end her day. Diggins is known for her drive. That grit was evident as she chased in her semi after the Kalla roadblock. Remaining positive, Diggins noted the cacophony of cheers as she began her day. 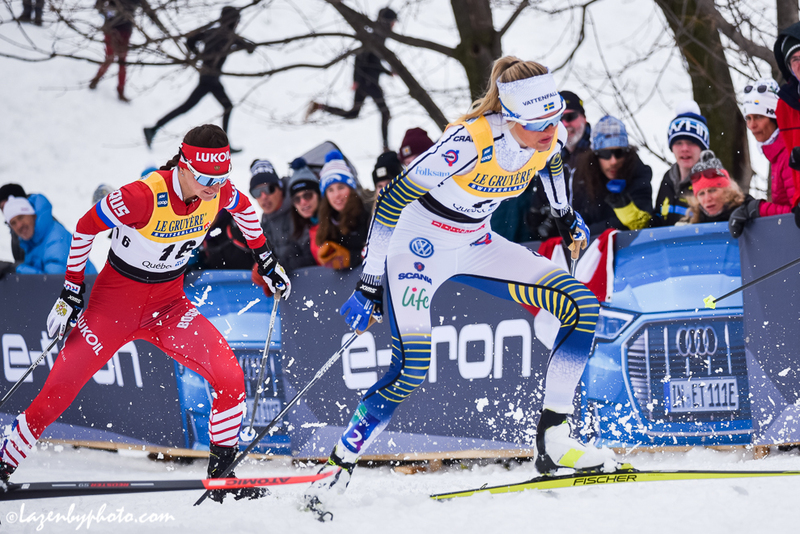 Despite the snafu on the course and the almost-advancing effort during her chase, Diggins said believes she is in a solid place for the two remaining races. 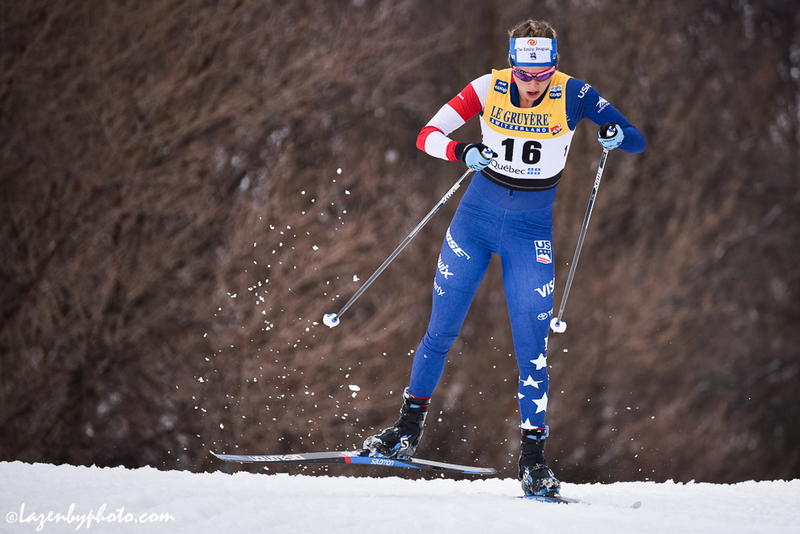 With the sprint races concluded for the season on the World Cup, the U.S. placed three skiers in the top-eight in the sprint rankings. 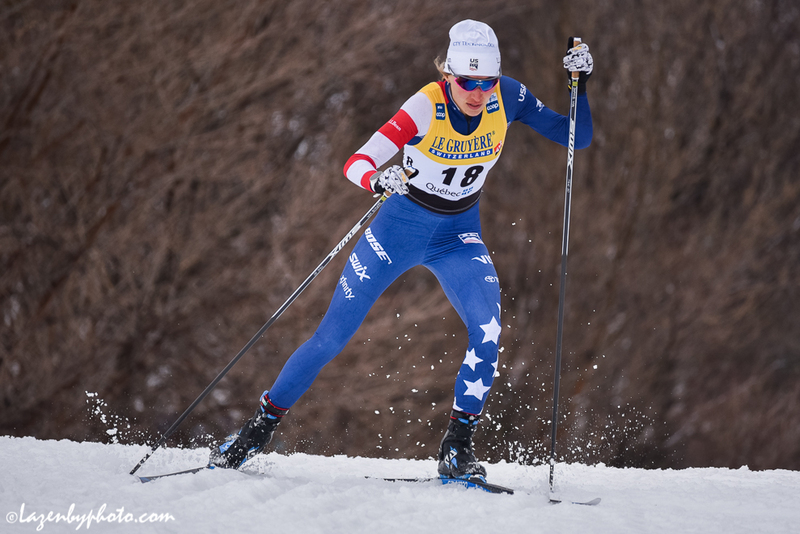 Beyond Caldwell’s fourth overall, Diggins finished seventh in the standings, Bjornsen eighth. -David Brown, Kelsey Dickinson, Gerry Furseth, and Gretchen Burkholder contributed. Double click the images below to enlarge.